The first flight of the Antares booster, one of two U.S. rockets selected to launch cargo to the International Space Station, will be delayed until at least late June as work to certify the launch pad continues on the Virginia coast, Orbital Sciences Corp. officials said Tuesday. 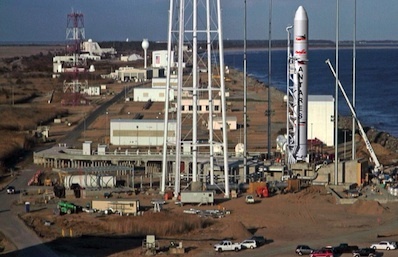 Artist's concept of an Antares rocket mounted on the launch pad at Wallops Island, Va. Credit: Orbital Sciences Corp.
Trouble certifying components of the rocket's launch pad has delayed the debut flight of Antares by eight or nine months, according to David Thompson, chairman and CEO of Orbital Sciences. Thompson said construction of the pad should be complete in early March, leading to certification of the facility's systems by the end of April, when Orbital will take control of the coastal complex to begin final flight preparations. An on-the-pad hotfire of the Antares rocket's twin-engine first stage is now expected in late May, Orbital announced Tuesday. A rocket with fresh Aerojet AJ26 engines will roll to the pad after the hotfire for the Antares demonstration flight, which will simulate a launch of Orbital's Cygnus cargo freighter to the International Space Station's orbit. The second Antares mission is now scheduled for late summer with the first functioning Cygnus spacecraft, which will approach the International Space Station and berth with the orbiting outpost. If all goes according to plan, another Cygnus spacecraft could blast off around the end of 2012 on an operational resupply flight to the space station. "Despite the launch pad delays, the Antares rocket itself progressed well over the last three or four months," Thompson said. "At the end of December, we had reached the 98 percent complete point in the rocket's development cost with less than $10 million of expenditures remaining to finish the testing over the next several months." Thompson said the first Antares rocket, designated for the ground hotfire test, will be ready to be transferred from the horizontal integration hangar to the launch pad by the end of February. But completion of the pad work is several weeks away. 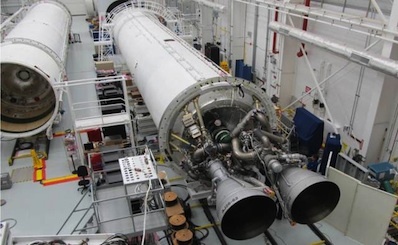 Two AJ26 engines, provided by Aerojet, have been bolted to the Antares first stage for an on-the-pad hotfire test. The engines were originally manufactured in the 1960s and 1970s for the Soviet Union's N1 moon rocket. Credit: Orbital Sciences Corp.
"One of the things we may be able to do is to take the first vehicle out to the pad in about five weeks, right about the end of March or the early part of April, and even though the pad won't be fully certified, we will get ahead of the game by doing some fit checks in the first part of April," Thompson said. The Antares launch complex, named pad 0A, is located at Wallops Island, Va., and owned by the Virginia Commercial Space Flight Authority, a state agency created in 1995. The launch pad lies on NASA property. Virginia and Maryland state governments later partnered to form the Mid-Atlantic Regional Spaceport to lure launch business to Wallops Island. The Virginia Commercial Space Flight Authority, along with its MARS subsidiary, were managing development of the new launch pad, which features storage tanks for liquid fuels and high-pressure gases. No other Wallops launch facility or Orbital Sciences rocket uses liquid propellants in such large quantities. "Most of the Antares delays we encountered over the past year at the Virginia spaceport on Wallops Island relate to the launch pad itself and the adjacent propellant and pressurization equipment," Thompson said. "The net effect of these problems has been to push out our schedule for on pad stage testing and the first launch by some eight to nine months over the past year. To more effectively address these challenges, Orbital took over day-to-day management of work on the spaceport's launch pad and its related propellant equipment last fall, assigning a 20-person contingent to direct and oversee the remaining activities through the first Antares launch later this year." According to Frank Culbertson, an Orbital senior vice president and deputy general manager, the launch pad turned out to be more difficult than originally thought. "The pad itself is the most challenging, largely because of the liquid fueling system," Culbertson said in a previous interview. "Wallops has never had that before, at least not at this scale. And liquid fueling is somewhat new to Orbital, too." Artist's concept of Orbital's Cygnus cargo freighter approaching the space station, as viewed from an astronaut's perspective aboard the outpost. Credit: Orbital Sciences Corp. The launch pad includes systems for rocket-grade kerosene, liquid oxygen, liquid nitrogen, gaseous nitrogen and gaseous helium. Some of the recent launch pad work included recertifying welds and cleaning propellant and pressurant tanks, according to Orbital. Thompson said the launch pad delay led to some increased costs for Orbital, but the cost of direct work on the launch complex is the responsibility of its owner. "Ultimately, the cost of the redesign, repair and rework on the complex itself will be the responsibility of the Virginia spaceport," Thompson said. "Once the pad turnover happens in some eight or nine weeks from now, the following couple months we'll have only ourselves to blame if we miss the schedule," Thompson said, adding the space station traffic manifest will ultimately determine the timing of subsequent missions. 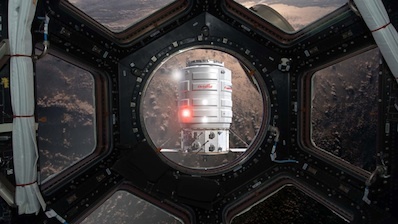 Orbital Sciences holds a $1.9 billion Commercial Resupply Services contract with NASA to serve the International Space Station with eight flights of the Antares rocket and the robotic Cygnus cargo freighter. The contract requires Orbital to deliver 20 metric tons, or about 44,000 pounds, of equipment to the complex over the eight missions. SpaceX signed a similar agreement for 12 flights worth $1.6 billion. For the development phase of their programs, Orbital and SpaceX have Space Act Agreements with NASA, establishing public-private partnerships to jointly fund the rocket and spacecraft with private capital and government money. SpaceX's Falcon 9 rocket has launched twice from Cape Canaveral, Fla. The launcher's third mission, topped by a Dragon cargo capsule, is due for liftoff no sooner than late April on a flight to demonstrate the spacecraft's ability to reach the space station.